Summary: Penniless, and escaping the horrors of life as a governess to brutal households, Maud seeks refuge with the cousin-by-marriage she never knew. But Juliana quashes Maud's emerging friendships with the staff and locals - especially John, the artist commissioned to restore the sinister Doom in the local church. John, however, is smitten with Maud and makes every effort to woo her. 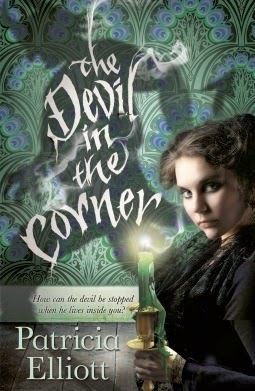 Review: A dark, gothic feeling book, Devil in the Corner tells the story of Maud, a girl down on her luck and on the verge of being on the streets. Desperate and barely eking out a living, she is relieved beyond words when a letter comes from a cousin of hers, offering her a palce to stay and the prospect of having a home and someday, an estate. I can find no fault with the writing style, which drew me in and made me curious about the setting - I can practically picture the moldering old house, and Maud's attempts to make her cousin Julianna as comfortable as possible. The alternating point of view between the main character and John gave insight as to the situation from the outside, too, which was interesting in the context of the overall mystery - it leads you on, making you wonder just what is happening, who is innocent and who is guilty in the madness of all the events. The biggest thing this book suffers from is that it's a bit overlong. More than once I felt that it was plodding along, and that lead me to skim some bits... Which is a shame when you're dealing with a book that's touching on death, romance, jealousy and madness! It felt as though certain ideas were repeated several times, and overall the book would have benefited from some more editing to whittle it into a tighter, faster moving plot. Fans of dark, dreamy sorts of books should check this out, but I'd say that people looking for a true mystery should give it a pass, as the ending isn't as clear cut as even I would have liked.